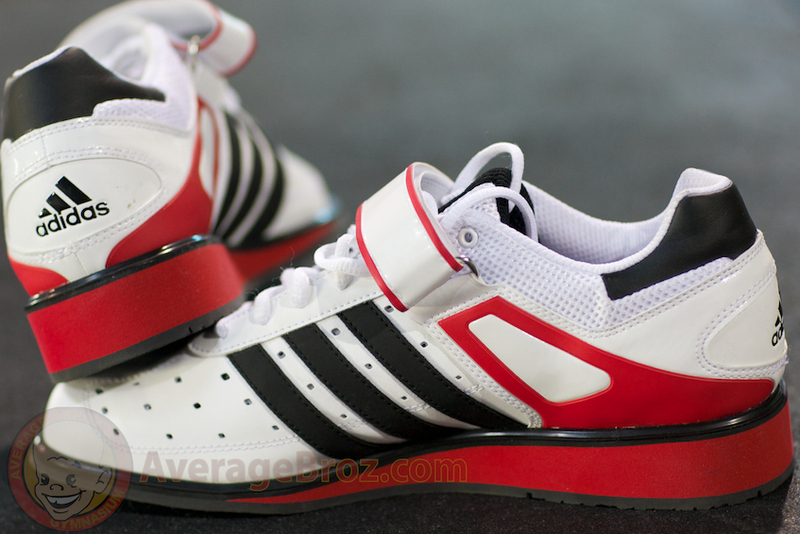 Adidas has 40+ years of Weightlifting shoe excellence and the Power Perfect 2.0 is nicely upholding this reputation. 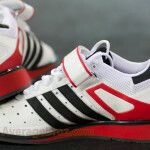 Released mid 2010, the Adidas Power Perfect 2.0 replaces the Ironwork III. When we first saw them, we were impressed. It was a major overhaul of the previous model with a fresh, modern look and new technology. It resembles more the original Power Perfect from the ’90’s than the Ironwork I, II, or III. Adidias has done away with the two piece upper and made it into a one-piece, PU-coated leather for more durability and better fit. The tongue is more padded and mesh inserts help with ventilation. For people with wide feet, the toe box initially felt narrow, but within a few weeks, they broke in nicely. The next change is the location of the strap. Adidas always has to monkey with the strap, so this time they moved it one eyelet closer to the ankle. Now when tying the shoe, it gets in the way. However, after it’s fastened, the shoe is very stable and the strap does not cut into your foot. Looking toward the future, Adidas has eliminated the classic wood heel and substituted it with a “wedge of high density polymer.” I’m sure this lowers manufacturing costs and seems to be the upcoming trend. The rubber sole is an improvement over the original Power Perfects and is carried over exactly from the Ironwork III. 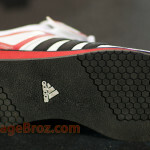 Upon closer inspection, we noticed during the change from wood to the polymer heel, Adidas eliminated the heel overlap. In the Ironwork III, the heel extended back beyond the rear of the shoe approximately .5cm (.25″). This gave the shoe additional stability from rocking backwards. The Power Perfect 2.0’s heel is almost equal with the heel cup. When beginners used the shoe, they felt a bit more stable in the Adistar. Experienced lifters are more precise, so the difference was minimal. Doing our inspection, we weigh each shoe individually to check manufacturing tolerances and quality control. The Power Perfect 2.0 were < 1.5% difference than one another. This is average of all tested, and acceptable within the industry. The overall shoe weight is also average. Not extremely light, but not heavy. The quality of workmanship is top notch. The stitching is even, the colors vibrant, and the details are excellent. Besides stability, pitch or heel lift is one of the major reasons why people buy Weightlifting shoes. An elevated heel provides improved body positions and enables you to lift more weight. Heel height is worthless without considering the overall pitch (angle) of the shoe. If the forefoot of the shoe is thick, then the effective heel height becomes less. This is why we measure both heel and forefoot and calculate the overall pitch. On the Power Perfect 2.0 the switch from wood to the polymer didn’t affect the the pitch. It remains consistent with past models at 7.5%. When wearing the shoes about the gym, it’s fairly typical of any Weightlifting shoe. Easy to walk in but not something you are going to wear for sprints. During training it was the status quo. 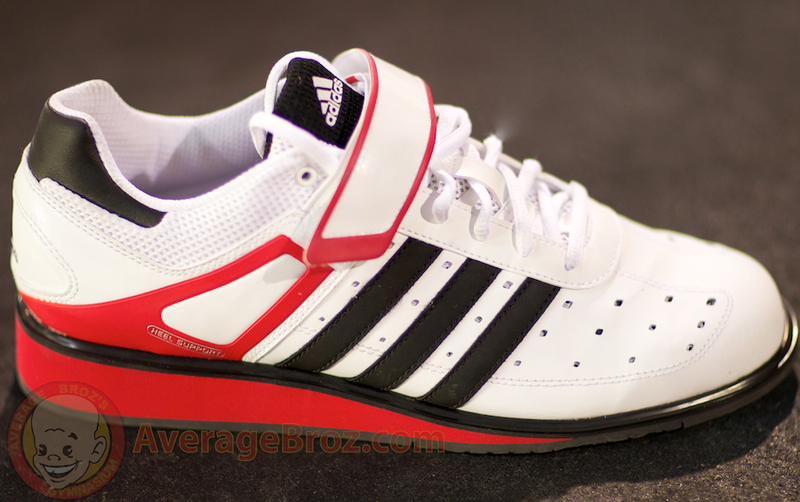 They are typical of every Adidas Weightlifting shoe for the past four generations — Great! The shoe provides excellent lateral stability and felt very solid and sure-footed with weights overhead. Experienced lifters could not feel any difference in body positions with this model and were able to immediately train without being distracted by the shoes. After ten minutes of wearing them, most had forgotten they were wearing different shoes at all. 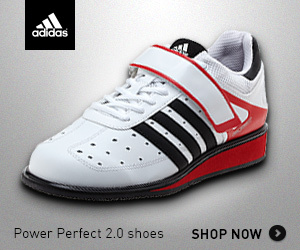 With the Power Perfect 2.0, Adidas comes through with another quality product that will help you achieve your best lifts while maintaining their integrity to serve you for years to come. Because this shoe is only available in Men’s sizes, women should order 1.5 sizes smaller, 2 if you have narrow feet. It seems like this shoe is not ideal for Olympic weightlifting. What do you think about this?